You are here: Home / Multiple Ways / 7x7 / outfit post: 7 pieces, 10 outfits – summer! New installment of 7 pieces, 10 outfits for Summer! The idea of this post is to show 10 outfits created from 7 pieces (not counting shoes/accessories) to help me to stretch my brain for different & new ways to wear a few items. Below you’ll find my 7 clothing pieces with affiliate shopping links and the 10 outfits I put together. 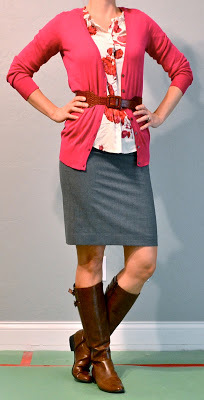 This is really a great idea, I should try it for my office style series. I’d love to see it! I love your work style!! These posts are my favorite! Though I think your Florida might be showing–I could never handle that many layers in the summer! Is there anything you don’t look amazing wearing? hi, love the post and the blog. That Gingham dress is great on you. I bought the exact same one late last year, but, have not had a chance to wear it yet. Lots of reviews about shrinking when washed… did you have that problem? Yes it did shrink a little. But I bought it very shortly postpartum two sizes up so the slight shrinkage actually made it fit better. I agree that there are too many layers for this to be a summer post. Pants and long sleeves do not work for my summer mom style. I know you do a lot of business outfits which is very inspiring for work, but what does your momiform look like? I’d be interested to see your mom-friendly outfits. 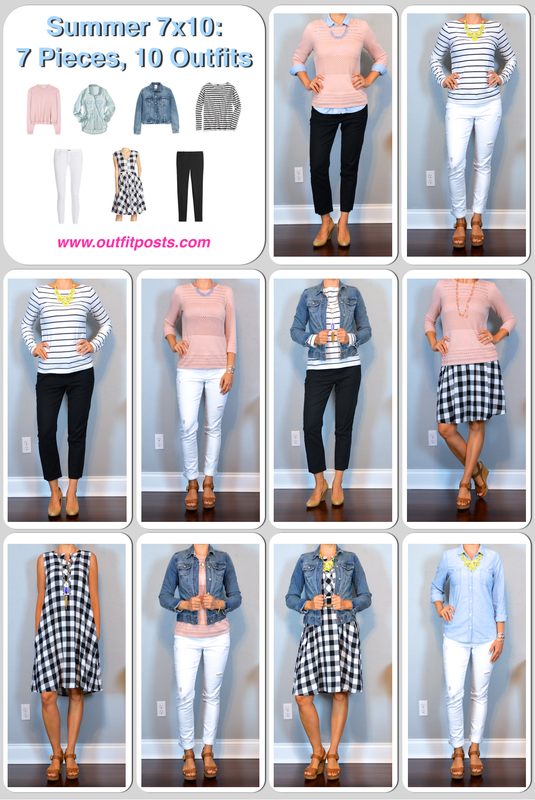 Maybe a 7×7 mom friendly outfits? I’m a teacher and I love your work posts, but in the summer when I’m off, I get to wear mom clothes. I don’t want to get stuck in the rut though. In hindsight, I should probably have called the graphic spring capsule, not summer. Where in the world do you live? I couldn’t even drive to work and walk in the building without soaking through a summer sweater or jean jacket! Cute picks though, especially the pink sweater over blue shirt. Very Pantone colors of the year. I live in Florida. I’m weirdly heat tolerant, work in a freezing office and have a hubby who cranks our a/c to arctic so I have skewed idea of what’s okay to wear. Would have made more sense if I had called this capsule ‘Spring’ to account for what pieces I used.